I remember the time that I was not really fond of sweet food. Growing up in Hong Kong, dessert was never an important part of the meal. The sweetest food that my mom ever made was the red beans or mung beans soup. And I kept on asking her not to put too much sugar in, otherwise I would not eat it. But even at that time, when it came to chocolate, I did not treat it as dessert or candy. It is "chocolate". A special class of food. After coming to Canada, my taste palate changed. After getting married, my taste palate changed even more. 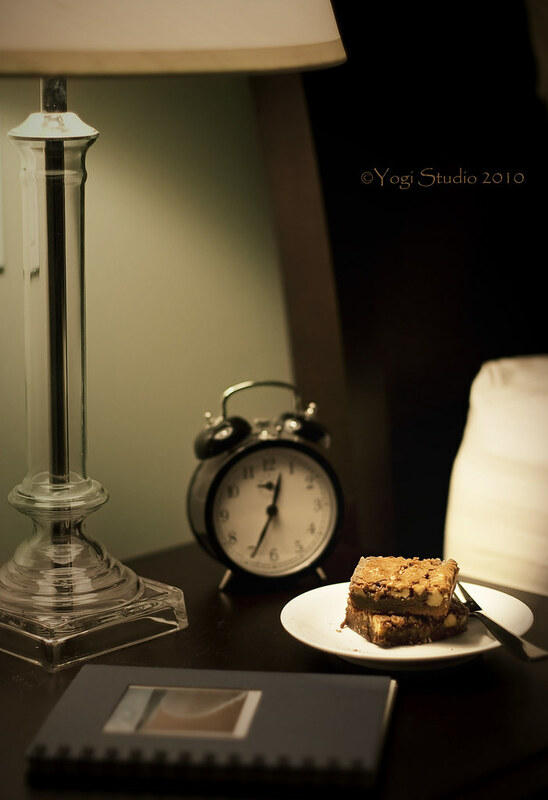 Although I still do not like food that is too sweet, I do love dessert and crave for it very often. And my love for chocolate is even stronger, as N goes for anything with chocolate. But, as much as I love sweets, I am trying to exercise the principel of moderation, not to go overboard with it. 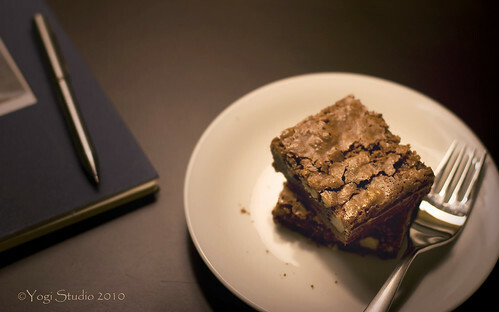 Out of my craving for sweets, I finally made these brownies again. I first found this recipe in Lori Longbotham's Luscious Chocolate Desserts, one of my favorite chocolate cookbook. There is another version of it with more chocolate in Dorie Greenspan's Baking: From My Home to Yours . I have yet to try it. I stuck with the original recipe this time because I recalled how much I loved it the last time I made it. These are not the cakey type of brownies. These are the rich, sweet, fudgy, melt in your mouth brownies. These are the brownies that make you sneak out to your fridge late at night and break all your dietary rules. As mentioned by Lori Longbotham, you should let the brownies cool down completely before you cut it. They are quite sticky, so use a sharp knife. It is easier to cut it if you chill it first. You can serve it at room temperature. But to me, I like it chilled. The first time I made it, I was not used to the fudgy brownies. I thought I did not like it. But after I put it in the fridge and tried it the next day, it was heavenly. I added a touch of espresso powder to enhance the chocolate flavor. which was in turn adapted from Family Circle magazine. Position a rack in the middle of the oven. Preheat the oven to 325F. Butter and flour an 8" square baking pan. Melt butter and chocolate in a heatproof bowl set over a saucepan of about 1 1/2" of nearly simmering water, whisking until smooth. Or melt it in the microwave. Remove the bowl from the heat, add the espresso powder, sugar, eggs and vanilla, whisk until well blended. Whisk in the flour and salt just until well blended. Stir in the walnuts. Transfer the batter to the prepared floured pan. Bake for 35 to 40 mins, or until a wooden pick inserted in the center comes out sticky, with just a few crumbs clinging to it, but is not wet. Do not overbake. Cool completely in the pan on a wire rack. Chill and cut into 9 pieces. Grace, I know this is a late response, but I have to finally emerge from "lurking-without-commenting" and tell you how much I love these brownies. They have become my go-to brownie recipe and I have made them about twice a month since you first posted the recipe. Once, I replaced the espresso powder with whisky for a twist on the flavour profile. I've started using sea salt instead of table salt for a more present saltiness, and lately even sprinkling the top of the poured batter with sea salt for a definite salty-sweetness. Last time I made them, I discovered too late that I was out of white flour and substituted whole wheat flour, and it actually helped them firm up a tiny bit and my family loved them. Anyway, thanks for the great recipe and the beautiful blog--I love your recipe ideas. @julienne - Nothing would make me happier than having someone tried and loved the recipes that I shared on my blog. Thanks so much for your comment! Great to know all the twists of the recipe that you've tried. 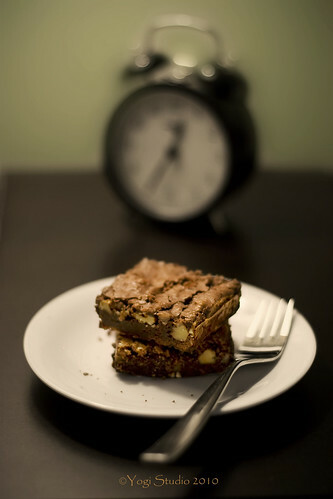 I love the idea of whole wheat brownies and the touch of the sea salt. I will try it next time!